Last month I had the pleasure of attending a luncheon at Union Station benefitting the Child Abuse Prevention Center. 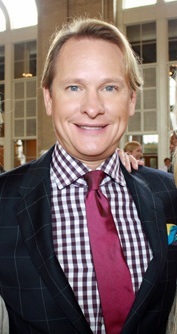 You might not expect the fashion stylist and TV personality Carson Kressley to be keynote speaker at such an event, but that’s exactly what was dished up along with tasty food catered by Wolfgang Puck. Carson, who looked dapper in a navy window pane plaid blazer, flat front trousers, a purple and white gingham shirt, tie and colorful pocket square, got the crowd laughing early. He dished up several nuggets of wisdom I feel are worth passing along. Achieving and maintaining great style is not just about clothes. Great style is also rooted in practices like these. Go to the spa.- In other words, do not forget about yourself and take care of yourself. You cannot take care of others properly if you aren’t well cared for. Be grateful. Think about all you do have rather than what you do not. That little act will create an attitude of gratitude and take your mind off the negative around you. Learn to take a compliment gracefully. When someone compliments something about your appearance or an item you are wearing, say thank you, and don’t look for an ulterior motive. Learn to give a compliment. When you compliment others, it puts you in a positive mindset, not to mention the person who is on the receiving end of your compliment. Focus on giving. It could be your time, talents or money. All of us have been abundantly blessed with all three, and we are expected to give back a portion of everything we receive. Giving takes the attention off of you for a while and gives you a sense of perspective. Find your best side. Do you have a photo of yourself that you LOVE? Put a copy of it on your bathroom mirror or in your closet to remind yourself how fabulous and beautiful you are. Raise your self esteem. Next time you attend an event, position yourself in the front. Don’t worry, you won’t be called on or asked to speak. Being front and center will show others you aren’t afraid to be in the spotlight. Ultimately, little actions like this will raise your confidence. Create a 30-second commercial. Think of all the great things you have going on and all of your attributes. Then create a commercial you can repeat to yourself on an as-needed basis. Stand up straight. Even if you aren’t extremely confident, if you stand and walk with purpose, no one will be the wiser. Be a role model. Find a child to mentor. Spend more time one-on-one with your kids. Do the right thing even when no one is watching. You are a role model to others even when you least expect it. You never know who is watching you and modeling their behavior after yours. Bravo to Carson for giving us these important reminders which point us back to the things in life that are truly important. Who knew he had it in him? This is great Bethany. Thank you! !